Is my trading strategy a winner? The back testing functionality allows traders to quickly and easily test their trading ideas. It is also possible to considerably improve the quality of trading strategies and methodologies ... without the need for programming. The trader can add technical indicators using plug and play technology. Indicators can function as a filter or as a trading signal. Other filters such as time filters or external strategies can also be applied. Various stop orders and profit targets or indicators can close the positions. The optimization window allows the user to select the objective towards which he wants to optimize his trading strategy or a parameter thereof. There are currently 12 objectives. 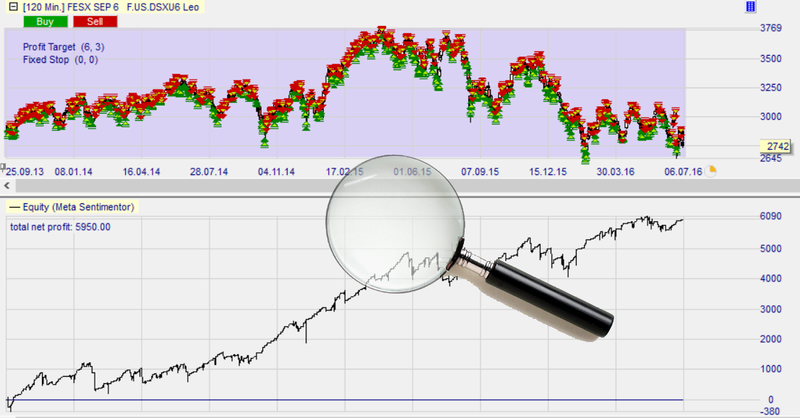 For example: total maximum profit, total profit/drawdown, maximum number of winning trades ... . The theoretical trades of each strategy optimization are shown in the chart. The trades are complete with signal, filter zones and stops. A visual analysis of a trading strategy is much more relevant than a table with numbers. The cumulative profit chart below is a key tool in evaluating a trading strategy. Are the profits due to a few trades only? Are there only profits under particular market conditions? Or, are the profits nicely distributed over the full period? Unique to the platform is that the chart updates in real-time! Change something to your strategy and you immediately see the effect. A detail information report provides a complete overview of the trading strategy with number of trades, losses, winning trades and maximum drawdown and is a very helpfull tool to evaluate the traders' strategy.